The Canadian province of Ontario, which lies across Lake Huron from Michigan, and is home to about the same number of people (10.3 million there, 10 million here), has supported one of the planet’s active conversations on the ties between a strong economy and a clean environment. Much of the dialogue centers of global climate change and the province’s coal-fired power plants, one of which, the Nanticoke plant on Lake Erie, is among the largest on the continent and each year pours thousands of tons of sulfur, mercury, nitrogen, and oxides on New York and New England. Four years ago, when he was running on the Liberal Party ticket for provincial Premier, Dalton McGuinty promised to shutter Ontario’s five coal-powered generating stations by 2007 in order to reduce greenhouse gas emissions below 1990 levels and comply with the Kyoto protocols. Premier McGuinty suggested replacing the power — coal burning plants accounted for 24 percent of the province’s electricity production — with a combination of hydro, wind and other renewables, and generating new commerce and jobs. Roughly 45 percent of the province’s electricity is produced from nuclear energy generated by 10 reactors housed at three enormous plants, according to the Canadian Nuclear Safety Commission. Though Premier McGuinty succeeded in 2005 in closing the Lakeview coal-fired plant in Mississauga — and demolishing it with explosives on June 28, 2007 — he missed the 2007 deadline for the other four. Last month, as another electrion approached, he announced in Toronto that wouldn’t happen again. His government just approved a regulation that requires all of the province’s coal-powered generating stations to close by 2014. “There is only one place in the world that is phasing out coal-fired generation and we’re doing that right here in Ontario,” he said. It’s important to note that as coal is phased out as a fuel source in Ontario, the province’s economy is surging because of a new green, clean, land-conserving, transit-focused economic strategy. The provincial government announced last month a $17.5 billion program to expand Toronto’s commuter and light rail rapid transit system by nearly 600 miles. The provincial unemployment rate is the lowest it’s been in more than 30 years. More than 1 million acres of open space are being conserved and set aside in the Toronto suburbs to slow sprawl and improve the quality of life. Now let’s turn to Michigan, which is representative of the economic conditions in all of the Great Lakes states and is slipping to the back of the American economic pack according to most economic and quality of life measures. Let’s talk just about coal-fired generating stations. 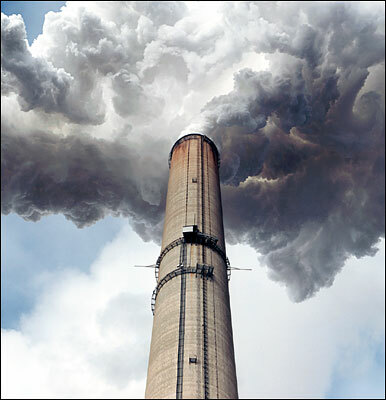 Michigan, Illinois, Indiana, Ohio, and Wisconsin have the highest concentration of coal-fired power plants in the nation and produce one-fifth of the carbon dioxide emissions, according to the Department of Energy. These states also have among them the highest rates of unemployment, lowest rates of job growth, highest rates of outward migration by young people, and Michigan has the largest state budget deficit in the nation. Is there a relationship between a region’s decline and the fact that it generates most of its power from a dirty 19th century boiler technology and an 18th century fuel source? It’s not just the practice of making power from coal, it’s the moribund thinking. Michigan spends $18 billion on energy every year, most of it importing fuel — coal, oil, natural gas, uranium — from outside the state. Shane Lopez, an energy researcher and senior at the University of Michigan who’s working with us this summer at the Michigan Land Use Institue, prepared a grounding memorandum that found the state’s 15 coal-powered plants larger than 100 megawatts, and five that produce under 100 megawatts, provide 65 percent of Michigan’s energy. According to a 2006 national energy efficiency scorecard, Michigan ranks 33rd among states. Vermont, Connecticut, and California were national leaders, and not surprisingly their economies are much stronger. Shane also found compelling documentation, including a 2001 study by the Regional Economics Application Laboratory at the University of Illinois, that a concerted state project to boost energy efficiency and renewable energy would produce 38,000 new jobs in Michigan and increase the gross state product by $3.4 billion annually by 2020. Michigan, though, is having none of this. At the moment state officials are poised to begin reviewing applications to build two and perhaps three new coal-generating power plants — Rogers City on Lake Huron, and Midland are sites that have been publicly announced. Governor Jennifer M. Granholm, a Democrat, has said little to date about the projects though her aides have privately said the governor is committed to “going anywhere and doing anything” to generate new jobs. Governor Granholm proposed the 21st Century Energy Plan for Michigan in January. It recommends spending $68 million a year for energy efficiency improvements. The administration and the Legislature blame the state budget deficit for preventing them from investing in the program. The 21st Century Energy Plan also calls for generating Michigan’s electricity from coal. Late last month, the state Department of Environmental Quality issued a statement that said it would require new plants to meet tougher emissions and operating standards. Canadian economy is strong, based on natural resources, mining and … tar sands. Suspect this carries over to Ontario, where most Canadians live. Energy – my vote would be, like Ontario and France … nukes. See NYTimes on the promise but lack of delivery of solar (and, although I have solar hot water in Lansing), solar not promising for much of Michigan – esp when we need it, winter. Personally I have big doubts about ethanol – politicians love it, which gives me even more cause for concern.